This romantic heart design is full of swirls and life. 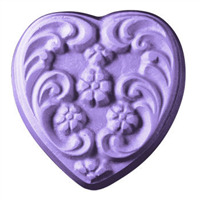 The Victorian Heart Soap Mold is perfect for Valentine’s Day or weddings. COMMENTS: I really like this mold. It makes nice hearts that look like a cross between celtic and victorian design. I just ordered my 3rd one so that I can use them to make favors for my daughters wedding. 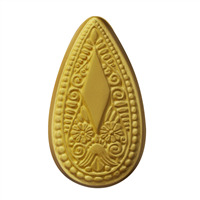 Out of all my molds this is the one she chose for her wedding soaps. I mainly use it for melt and pour, but have used it for bath bombs and lotion bars too. It worked fine for both those. "Milky Way: beauty & functionality perfection"
COMMENTS: As always with Milky Way molds: perfection. These are built the way plastic molds should be: perfectly balanced (so that the mold doesn't tip off-level when you pour one cavity), perfect strength for an incredible life-span, and perfect beauty and uniqueness. These hearts are the perfect size & weight -- just right to grip in the hand. I love them! • Uniqueness/beauty that is Milky Way! • I would ***LOVE*** a guest size! COMMENTS: I love the size and shape of this heart mold. Perfect for Valentine's Day or just becaus. "Very pretty. Quite a bit bigger then I expected. " COMMENTS: This mold it very nice, the design is pretty and clear. It's hard to judge the sizing on the milky way molds. 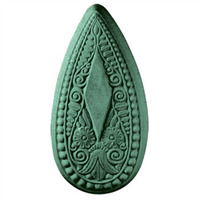 This is very large for a bar of soap, the mold is very deep. I know it tells you the ounces each holds, but it would be nice if there another picture to help with the sizing. Other then that it is as expected. The milky way molds does remind me of the Wilton chocolate molds which don't really hold up so well to a lot of uses, so I guess I'll have to just see how this one stands up. 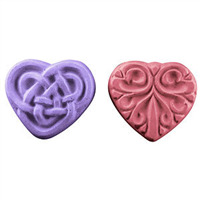 COMMENTS: This heart mold is perfect for soaps and bath bombs. I usually don't like hearts but, I do like this mold. Feels pretty sturdy so I should have it around for a while. Nice mold. COMMENTS: So easy to work with and such lovely results. COMMENTS: This mold is beautiful! 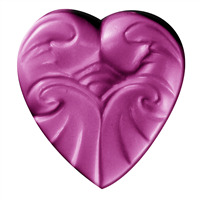 I made some soaps for Valentine's Day using this mold & they came out stunning! 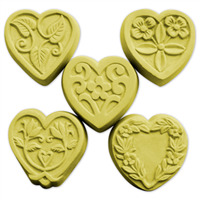 COMMENTS: Worked great for Valentine's Day gift soaps, was easy to work with. The finished product was beautiful, and simple to pour. Was a nice size for my two-bar gift crates. "Is this price for one mold? It says it makes 3 bars, but it really doesn't say there are three included." It is a single tray with three cavities. The price is per mold and there are 3 cavities in each mold.